If any one understands the value of "Brand India", it is Raghavendra Rathore. Raghavendra Rathore was born in Jodhpur in Rajasthan. But his primary schooling was done at the prestigious Mayo College after which he studied at Parsons School of Design in New York. Before and immediately after graduation in 1992, he gained experience with many top Manhattan labels including Donna Karan, Bill Blass and Oscar de la Renta. This exposure enabled him to refine his design knowledge before setting up his own label, `Rathore` back in India. The "Rathore Jodhpur" brand has a clean and modern sensibility that is driven by a holistic vision of luxury, inspired by the old-world charm of Rajasthan. His work has been appreciated in the domestic as well as the international market. 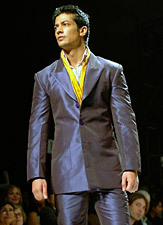 He has designed the wardrobe for famous celebrities like Shah Rukh Khan and Amitabh Bachhan. And now Rathore is no stranger to the glamorous world of Seventh Avenue fashion. Rathore, over the last decade, has managed to create the right mix of aesthetics to craft products that work globally. Rathore believes that fashion today has long ceased to be one theme, one mood, and one idea. Instead, Rathore offers a superb mix of textures, modern fabrics, slinging cuts and a vast colour palette that blinds the richness of his styles. Clever mixing of his clothes gives the customer endless choices of putting together a look for the day or for cocktail and the evening hours. Working in various mediums such as web design, interior and home furnishing design, iron and wood furniture design and fashion design, he works towards setting newer standards on the design frontier. He is presently retailing in Hong Kong and Greece, and in Ensemble (Mumbai), Ogaan (New Delhi) and Camelot (Goa). The last show of the LIFW 2002 featured the brilliance of Raghuvendra Rathore who in his trademark elegant style proved once again that good taste, simplicity and perfection are the fashion mantras for today. A varied use of fabrics like crepe, shot silks, simple whites, brocades, stretch lycras, suede and leather in a vast range of clothing held the audience spellbound. Rathore consisted of two distinct looks, the more western and yet India inspired and the other formal and completely Indian. There were pants, skirts, shirts, jodhpurs, sherwanis, bandhgalas and beautiful saris all creating a regal look. Raghavendra`s collection was a perfect blend of minimalist western chic and Indian legance. The women`s collection of fusion silhouettes was worked in high quality linens and cottons featuring minimal, but stylish embroidery on long lean lines. Skirt shapes were long and straight, trousers were slim: flared or straight legged. Tops were mostly laced and tied to fit with hint of the Orient in elements of the embroidery. The small men`s collection kicked off with long cool kurtas in neutrals then flowed into western and fusion heavier weight suits. Rathod`s range of men and women`s wear was stylish and yet simple. Slim long skirts and slender pants with long side slits were teamed with long shirts-coats, Nehru collared shirts, and backless blouses held together at the front with fine ties. Also seen were exuberant organza skirts tucked in at places to created volume. The colour palette had jewel tones of orange and pink shots, impressive blacks, maroon and stone. Some of the skirts for eveningwear were richly embroidered in old gold, while others were paneled with fabrics and prints of different colours; appliquéd on with gold flowers; and decorated with patched pin-tuck detailing. A multitude of pockets were used as design details. The men`s wear range was very impressive, especially the shirts. Their stand-up collars, slim fits and square shoulders created an understated masculine look, which was extremely becoming. Subtle detailing was added in form of interestingly placed seams, and pin tucks. Bandhgala jackets and Jodhpuri riding breeches were also part of Rathore`s collection. The collection portrayed modern silhouettes on a global format, using cuts that resonate a classic shape. There were structured textured jackets paired with slim tapered pants, stretch pants and skirts. Shades of black highlighted with ancient antique gold, pistachio green and fresh wines were the leading colours of the collection. Taking tailoring techniques to a new level, Rathore has focused on a collection, which exemplifies Old World feel in an ultra-modern avatar. Inspirations from Art Deco and old archives of Jodhpur play an integral role in the creation of his Fall Collection 2006.